As a proud Brit I wondered for a while what I could enter into this fine contest. Quite a lot of the world's railways still uses equipment designed and built right here in the UK, and I wanted to try to build something distinctive and clearly not British. 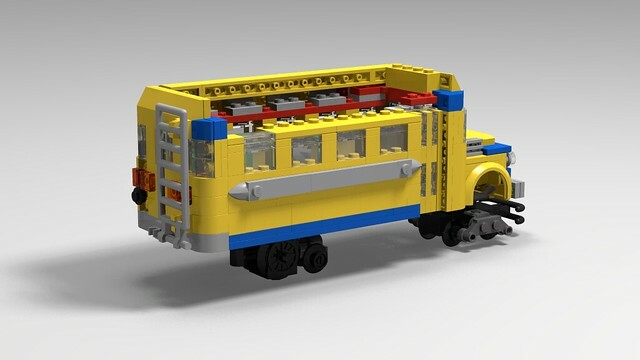 Earlier this year I designed my own LEGO version of the Oslo Tram 2020 concept but, as much as I like it, I decided that I didn't want to rush into building it. Then I had a brainwave. Come with me to South America, to the Andes and the high Altiplano on the borders of Peru and Bolivia. Life is harsh and transportation is difficult over the inhospitable terrain of the Andes. And yet the railways exist even here. But there are no modern express trains whisking extravagantly coiffed socialites in air conditioned comfort, no at-seat refreshment service offering a selection of hand-ground coffees and artisan baked goods, and certainly no high-speed rail connections linking the glittering capitals of these two proud nations. Instead, there is this. It's a 1952 Dodge "Ferrobus", one of a motley selection of improvised railbuses running on Bolivia's metre gauge network. No other rail vehicles are light enough to safely traverse the poorly maintained track, and so these plucky little vehicles ply back and forth across the Andes and provide a lifeline to isolated communities. Even so, derailments and other mishaps are not uncommon and the service depends on the skill and determination of the crew to deal with any situation that may arise. I have no personal connection with these railbuses, as I have never travelled to the Andes to gain first-hand experience of them. However, as a railwayman myself, I have a great admiration for my Bolivian colleagues who run these services and for the vehicles which seem so unsuited to such a large and demanding challenge. My entry will be a tribute to the railways of the Andes and to the people who run them. As you can see, I'm already quite a long way through the design process because I started my designs within a couple of days of the announcement of this year's contest. Most of the body is done, although the roof still needs to be finished together with the roof rack and other details, and I still have to decide where to hide the battery. Some parts of the model have already gone through quite a few redesigns, most notably the front bogie, and there are some parts I'm still not sure about. I'm borrowing the power and control concept from the tiny TRAXX loco I built a couple of years ago, with drive from an M motor, control coming from an SBrick and power from a 9V PP3 battery. 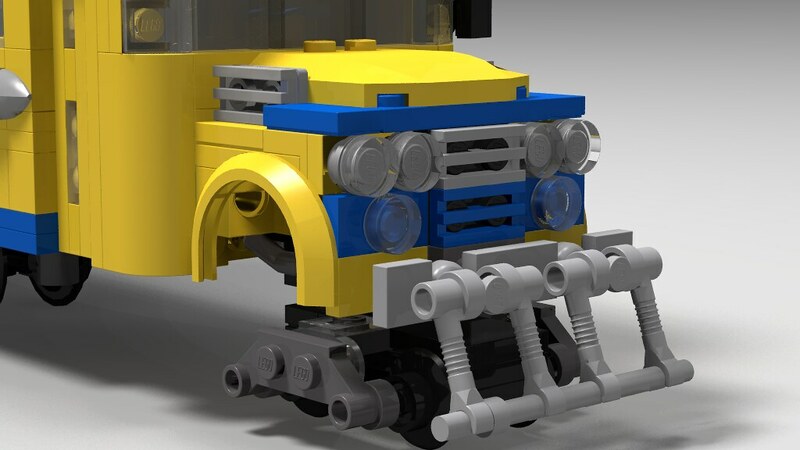 My initial thoughts are to run this train on standard LEGO narrow gauge tracks, but this means that a fixed rear axle, as used on the prototype, would be unworkable. Therefore, I have designed a small and hopefully unobtrusive bogie to allow the rear axle to articulate, but I may come back and revisit this idea later. Good work so far! Impressive work if you can cram some PF in there as well. The rear "bogie" cheat is fine, it's barely visible from most normal viewing angles anyway. I do have a couple of points though. Firstly, the cow-catcher at the front needs work, unless it's just a placeholder. Also, the tile, modified 1x1 half round might fit better for the main headlights. Unfortunately they don't exist in trans-clear yet, but if your model is staying digital I think it'd be fine. Anyway, I look forward to watching this unique idea develop! Hi @Hod Carrier ! It is a very good MOC, very "different" and very well done!!! I Like it a lot!!! Thanks for the excellent feedback so far. It's good to get the opinions and views of other builders as it helps to improve the final model. @ColletArrow I think it's an act of great generosity to call the contraption on the front of the railbus a "cow catcher", as I seriously doubt it's ability to catch anything larger than a medium-sized llama without folding up and pitching the bus into the nearest ditch Ha ha!! It appears to be little more than some hastily welded leftover scaff tubes. However, I do take your point. The design posted here doesn't look right and I will go away and try to come up with something a little less robust and, therefore, closer to the prototype. With regard to the headlights, it is perhaps difficult to see from the small prototype photo I included, but these old Dodges do have round headlights. I can see where the confusion may have arisen because these headlights are grouped in pairs and have a shared chromed bezel that is roughly oval in shape. Oh, nice choice of subject for MOCing, Hod Carrier! Due to my interest in Narrow-gauge trains, I, of course, also have a bit of a soft spot for the various narrow-gauge rail buses & rail cars used in various places, such as these ones, or the famous "Galloping Geese" used on the Denver, Rio Grande & Western's 3' gauge track. Heck, the East Broad Top RR (which I hope to be helping out with some volunteer work this weekend, if I can get over this darn head cold by then) has a Brill car-body rail car/rail bus known as the M-1 Doodlebug (I kind of want to make it in LEGO eventually, but they don't make the parts I'd need in Dark Red or Dark Green, which is what the original colors more or less are). @Laura Takayama Wishing you speedy recovery so that you can get out on the rails at the weekend. You’ve got a few days still to shake off the bug, so make sure you rest well and keep your intake of fluids up. I had not heard of the Galloping Geese before. You’re right, they are very similar to the Ferrobuses of Bolivia and elsewhere. They do make excellent light rail vehicles and very suitable for poorly maintained or lightly laid track as well as making good economic sense, especially in developing nations. I also looked up your Doodlebug. That’s a fine looking vehicle and would make an excellent MOC. Has it worn any other liveries in the past that better suit the LEGO colour palette? The M-1 is literally a one of a kind unit that was made in-house by the East Broad Top RR, based on a set of scaled-down plans purchased from the J.G. Brill Co (famous for all the various street cars they've made over the years), so it, unfortunately hasn't worn any other liveries. However they also do have a smaller rail car designated as M-3 (which is more of a VIP/inspection car) that would be easier to make in LEGO, due to its paint scheme being essentially bright red & black. As I am hoping that this model will be able to drive under it's own power, I thought it was perhaps time to discuss some of the more technical aspects of this model. 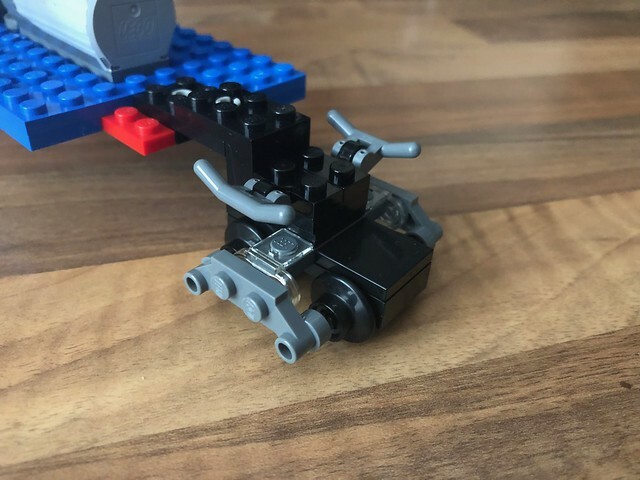 In my earlier post I mentioned that I felt that, due to LEGO's track geometry, it would be necessary to give this MOC a rear bogie rather than following the more prototypical route of having a fixed rear axle to provide drive. However, I really didn't want this bogie to be obvious and, therefore, I set about trying to design a power bogie that would be as small and light as possible. And this is what I came up with. Naturally there are potentially some disadvantages to such a lightweight bogie design. There is a very real risk that the torque of the motor could simply tear the thing apart. I am already envisaging the need to *ahem* help reinforce the joins between certain components, but even allowing for that it is possible that it will not be able to contain the forces acting on it and that the gears will not remain correctly meshed. However, only time and testing will tell how successful this design will prove to be. I briefly analysed your design in my head. I think that when travelling left-to-right the forces will help to keep the assembly together, but moving right-to-left there is (as you say) a risk that if the driven wheels don't want to move then the axles will just slide apart, disengaging the gears. Are you intending to plug the motor straight onto this? I get the feeling it might not be a bad idea to include a worm gear setup if there's space, to reduce the speed and increase the power the single axle has to drive the model along. 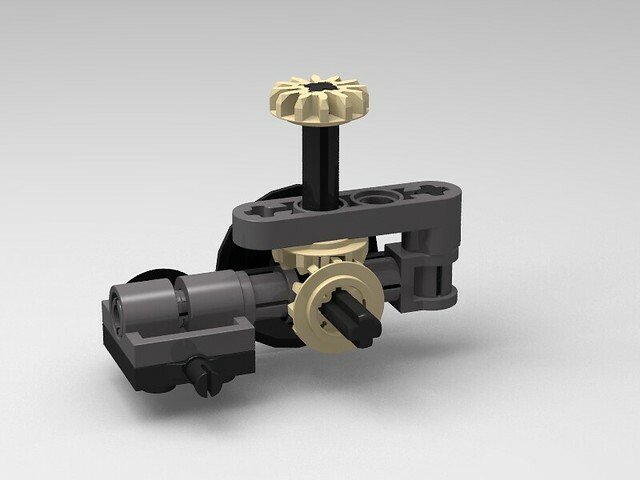 I hope you don't mind, but I decided to have a play in LDD and managed to iterate your design to the following. I reckon as it has more points of connection it will be stronger, but is clearly bulkier around the small wheels. Always the trade-off. 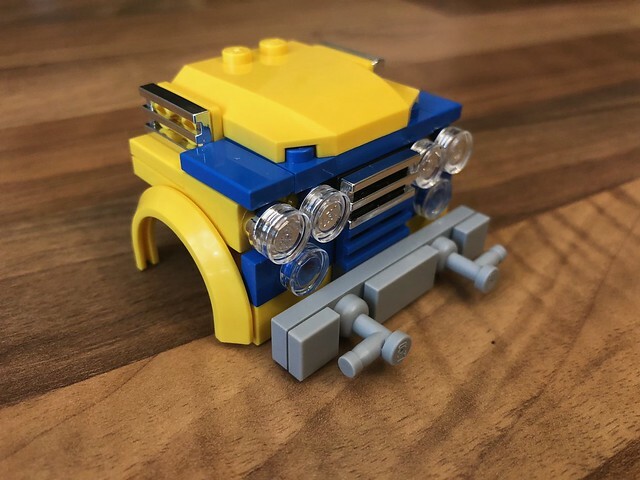 (Yes, the 2x2 plate with sprockets to hold the small wheels is missing - LDD says it clashes with the DBG technic part I've put in above it, but I disagree). But I'm a civil engineer, so what do I know? Probably a whole lot more about forces than I do, I expect. Thanks for casting your expert eye over my design. I was already suspicious that I might have problems, and I'm certainly not content with a single attachment point either, but you're the first to confirm it. I'm confident that the cross axles will prevent the top and bottom halves from being sheared away from each other horizontally, but I fear that the motor torque will either try to separate these halves vertically or push the entire bottom part of the bogie carrying both sets of wheels clean off the central assembly. Some strategically placed drops of glue might help prevent these issues, but there's nothing to prevent the motor still prying the two halves apart enough to prevent the gears from meshing. I'm hoping that the weight of the body bearing down will reduce this risk, but we shall see. One advantage is that this model will only need to move it's own weight and won't have to deal with any tail loads, reducing the chances of it stalling under power. The plan is to drive the vertical shaft through 90 degrees by a horizontal motor using bevel gears. There is sufficient space inside the body to run a larger bevel gear on the top of the vertical shaft to gear it down if necessary. I'm already considering doing this anyway to limit the model's speed because it's looking like it might be rather top-heavy and, running on narrow gauge track, vulnerable to toppling. Design work on the body and appearance of the Ferrobus has been continuing apace. The roof is on, I've found somewhere to hide a PP3 battery and I've added some detailing touches. 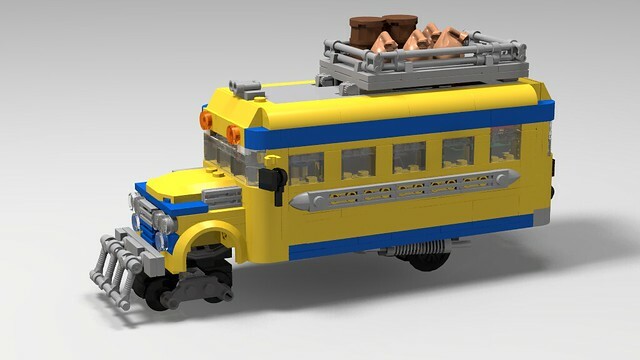 If I'm being critical, I'm not completely happy with the profile of the roof because it makes the bus look too square, and I would like some sort of corner piece like a 1x1 quarter dome or somesuch to help finish it all off. It may be subject to a redesign before completion. I have also rendered the bus with a prototypically correct fixed rear axle rather than the bogie I mentioned before, as I would like to try both arrangements to see if the more prototypically accurate axle can be made to work somehow. @ColletArrow will be pleased that the awful "cow-catcher" has gone and been replaced with something crappier and, therefore, closer to the prototype. I'm afraid that there are one or two rendering errors in these images, for which I must apologise. Some parts were rendered in the wrong orientations and some were not rendered at all. That looks really awesome so far, and extremely true to the original, lack of quarter dome pieces for the corners, nonwithstanding. 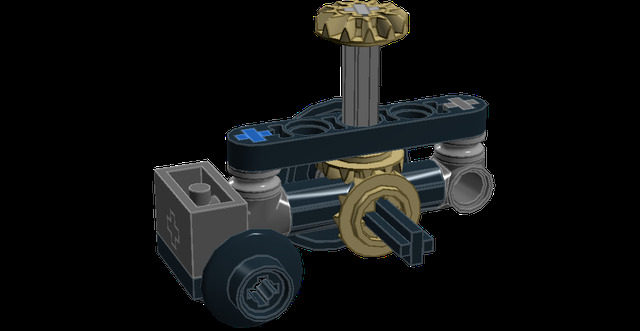 I also like the fact that you've been able to successfully incorporate PF into this thing, which is difficult, at best, with narrow-gauge LEGO train projects. Thanks guys for the positive feedback. 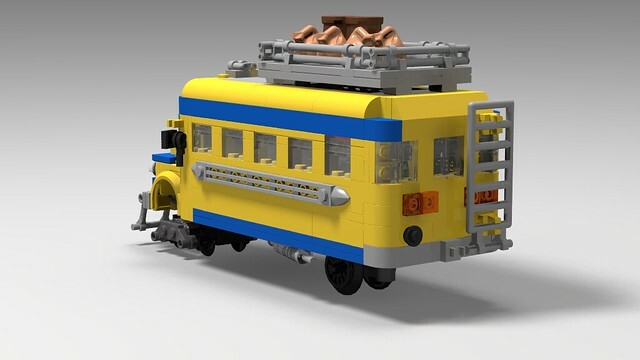 @Roadmonkeytj I'm not sure which part of the bus you wanted to use, but I'm very happy if you see anything you like about it that you want to reproduce in your own models. @Laura Takayama Getting power into this model isn't too bad, especially compared to the TRAXX loco I built a couple of years ago. Admittedly it won't take any of the LEGO batteries, but there's actually a reasonable amount of room to fit everything else inside. I will post up some photos of the internal configuration once I start the build phase. This part lol minus the front truck and "cow catcher"
Please do help yourself. As I missed out showing the internal structures during the design stage, I will be posting some photos of the build phase. But there's nothing terribly complicated going on under the bonnet (hood...?) that can't be guessed at. 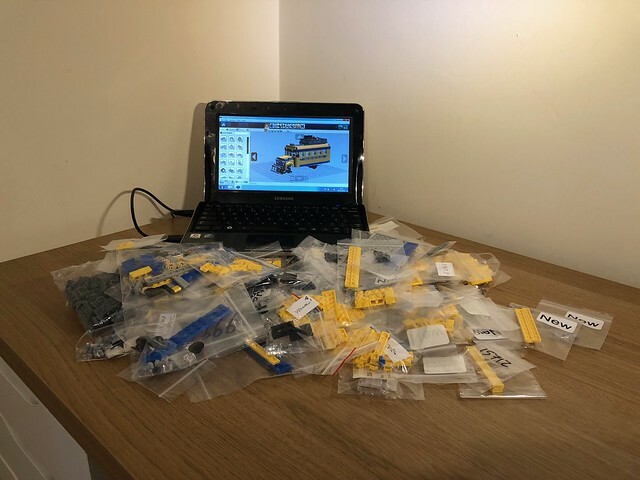 The postman has brought the last of my Bricklink orders and I think I have everything that I need to assemble the Ferrobus. I love the smell of LEGO in the morning. It smells like creativity. I can't say how pleased I am with the results. I genuinely expected the model to struggle on 4-wide gauge curves, especially with the fixed rear axle, but it seemed to breeze it. I'd even laid an outer oval of dual-gauge track with R40 curves in the full expectation that it wouldn't cope at all, but as things turned out this extra track was only needed briefly, and then only to check if the model accelerated on straight track (it didn't). So now I'm facing decision. I like the power bogie because it is a purer engineering solution, and I'm pleasantly surprised at how well the chassis works with a fixed rear axle. But does the small advantage of the power bogie justify it's use when the prototype does not use one? Thoughts...? Your works always have a perfect design ... even this time you did not make exceptions! I'd say go with the fixed, single axle; it's more true to the original, and it means you don't have to hide anything under there. I too am surprised at how well it runs, but seeing as it does why not keep it simple and accurate? 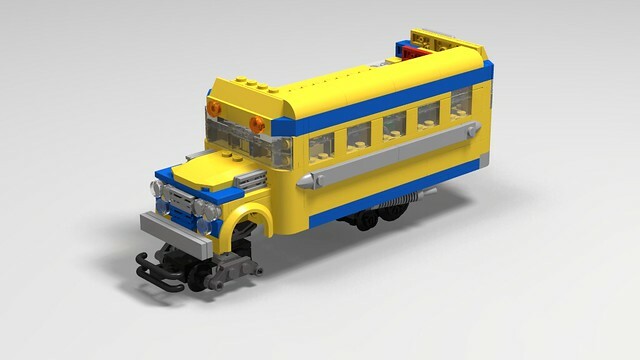 Either way, I'm looking forward to the bus running around in the bricks! Thanks guys. I think I’d favour the more prototypically accurate fixed axle also. It has the added advantage of being more sturdy than the bogie too. The only problem I found with the bogie was not actually to do with being weak in construction or any issues with the gears meshing, but that it kept falling out if I picked the model up. The vertical shaft that runs through the floor into the bogie is held in place only by the bevel gears themselves, and the grip was fairly tenuous. I think I may have slightly contaminated it with the silicon grease I’ve used on the small wheels which didn’t help, but once I’d cleaned it up it held well enough if I was very careful with it. I’m hoping to start building the body on to the chassis as the week goes on. There’s something a little special to come. That seems like a fairly unequivocal vote in favour of the axle. Thanks for the feedback. Now that I'm happy with the performance of the chassis it's time to do a little building. I was able to grab a few minutes before work today to make a start. The first part to be completed is the front bogie. It took a few goes to come up with a design that was narrow enough but still had the correct look, but this one not only looks the best but actually uses the fewest parts. Win!! I've also attempted to represent the leaf springs inside the wheel arches. When these buses were converted to rail use it appears that the Bolivians simply ripped out the front axle and steering and fitted a small bogie directly onto the leaf springs where the road axle had been. This leaves a huge gap on the real Ferrobuses which I have been unable to replicate. I also had time to make a start on the body, so I've got the front end done ready to go on the chassis. I thought I would do something a little special and anticipate the question that I knew everyone would be asking. "Does it have chrome?" But asking this is like questioning the Pope's religious convictions, wondering if Luxembourg is small and pondering on whether or not bears take their ease in the woods. It's a 1950s Dodge!! What do you think? And the chrome won't end there. There's still more to come.